Internet marketing is constantly changing, so it is important to keep up with the latest information on new techniques or trends that can benefit your marketing stragegy. Keeping up with current thoughts on marketing strategies is well worth the investment of time you make when you see how much better your website looks and how much more traffic you drive to your site. 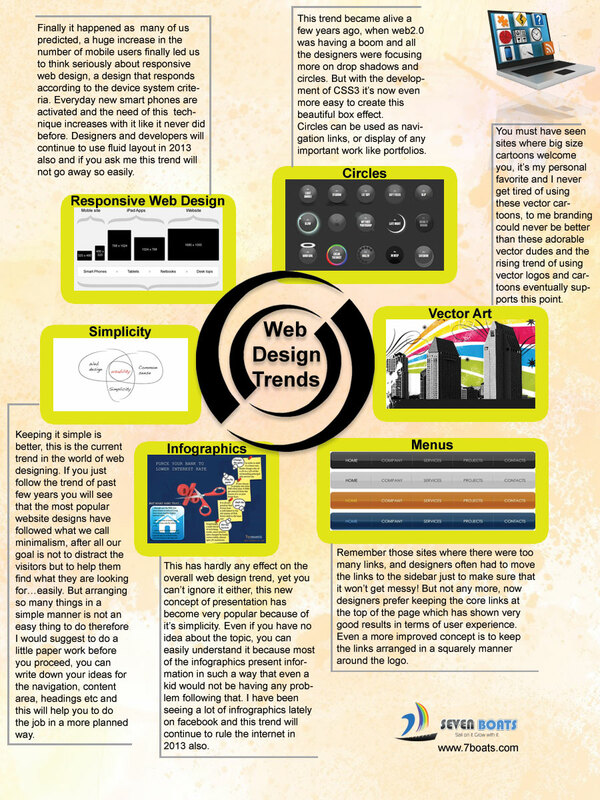 • Responsive web design has become the standard. Fluid layout appropriate for smart phone users is now the industry standard, and as more people move to tablet- or phone-based web browsing, that is not likely to change. Designing websites that can adapt to a variety of environments in a skill that web designers must cultivate to stay relevant. If it cannot be put on a smart phone, it is rapidly going to become obsolete. • Circles instead of drop-boxes. With the advent of CSS3, it has become easy to use circles as avatars for portfolios or radio button choices. Visually, circles are easier to find and they are easier to click than drop boxes that may disappear when a user moves the cursor. • Vector art captures user interest. Vector art with its big, colorful cartoons is appearing everywhere, and users enjoy the large, easy-to-process images. • Simplicity is important. Users complained of information overload with some websites where an overload of graphics and video caused them to be unable to focus. The trend now is to use minimalistic design that still gives users the information they need. Sophisticated, streamlined websites have become the order of the day. • Infographicsare growing in popularity. Giving information to people in easy-to-read graphic format is a trend that is going to continue. Users respond well to interactive and colorful graphics that put information into an understandable format and share important facts quickly and simply. • Top-sided menus. Sidebars may one day go the way of the dodo, thanks to formatting software improvements that allow designers to place menus at the top of the page–something users respond to in a positive manner. These are only a few of the projected trends for 2013 in web design, but they all point in one direction–making a user’s web experience effortless and fun. As web designers refine their craft, they will ultimately continue to simplify content and create great visual representations of data. Orange County SEO can help you determine which of the latest internet marketing trends can benefit your company and help you grow your business. The experts at Orange County SEO have the knowledge and experience to guide you through the complicated world of internet marketing successfully. Call us today for information on how to use internet marketing to build or grow your business to its greatest potential.